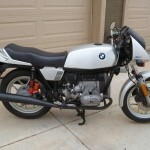 When BMW released the R65LS, it was really a remarkable styling excercise. Based on the staid (and slow) R65 series, the LS model added twin disc brakes up front, a sharp bikini fairing, model specific seat and tail section, painted snowflake wheels and model specific matte black exhaust. 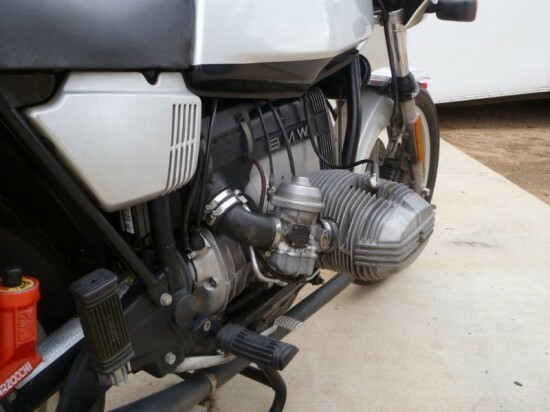 The rest of the bike was pure R65. Although no faster than the base model, the R65LS looked the part for a sport bike, and came with a substantially higher MSRP. The bike was styled by Hans Muth, best known for his work with the fully faired BMW R100RS and the sharp-edged Suzuki Katana. There is a little of that Katana in the front fairing, but the look is still unique. 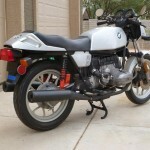 BMW claimed that the fairing reduced front end lift by 30% – but journalists of the time wonderened aloud if front end lift was ever a problem for the little R65. Too much power was never an issue, although this boxer – like all the airhead boxers before it – did its best work on the open road. With “sportier” (read: narrower) handlebars, the heavy R65LS takes a bit of effort to turn in. Chassis is what you would expect from BMW – reasonably comfortable but far from knife-edge handling. 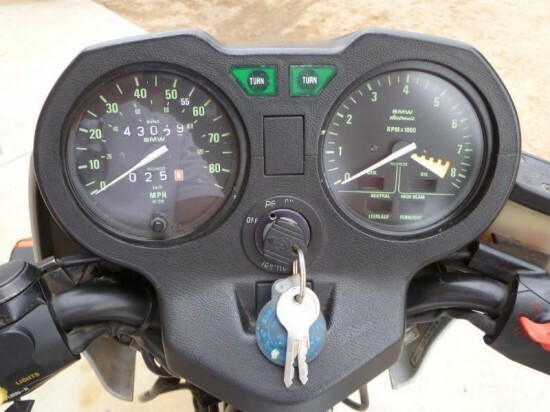 Suspension travel is adequate, but there can be a handful of shaft drive effect (the rear of the bike will rise under throttle and drop when the gas is chopped) if the rider is not careful. If you can put up with the odd way a BMW leans when you blip the throttle at a stoplight and you don’t mind the throbbing boxer twin on the highway, maybe this is the BMW for you. 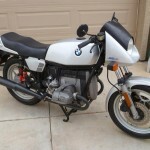 The R65LS was a limited model run; in two years it would be gone. 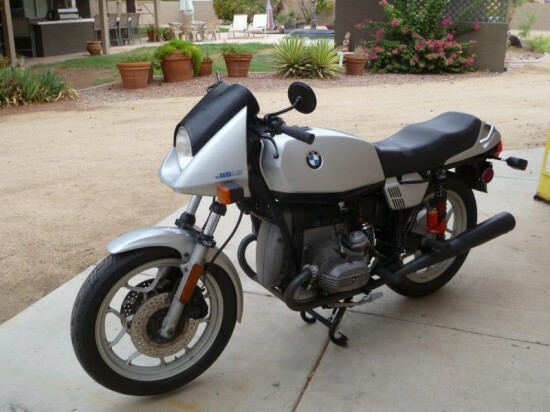 It was not the major seller that BMW had hoped, and thus it remains a unique and somewhat rare model. When properly serviced, an R65LS will make a suitable mount for in-town commuting through multi-day sport touring – as long as the “sport” part is not taken GSX-R seriously. The motors are very reliable and extremely robust – the mileage on this example is no cause for worry. 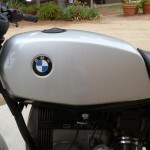 The side panels on a stock R65LS are not color coded, so these have been painted. Also, the new battery is a nice addition but I doubt it fits properly in the space provided. 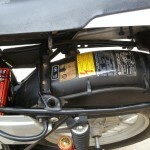 The R65LS takes a very specific battery size; use of a non-standard size will work, but precludes the use of the under-the-seat storage tray. Besides those nits and the obious seat tear, this bike appears to be in reasonable condition for its age. 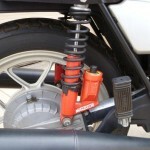 The upgraded rear shocks are a nice addition over the stock units. 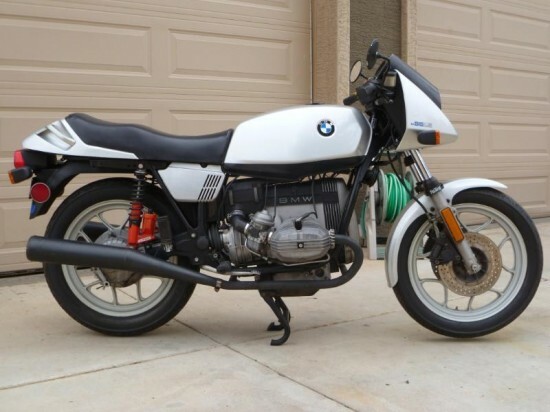 For your chance to own this unique piece of (relatively recent) BMW history, click the link and jump over to the auction. For the price, it will be hard to find a better way into the world of BMW – and you can do it with a limited number, unique ride at that! Good luck to both the seller and the buyer!